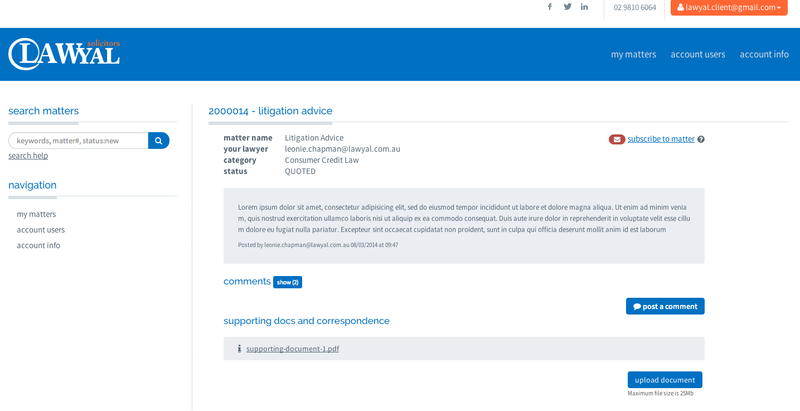 At LAWYAL, we’re always looking at ways we can improve user experience on our site, both for our clients, and our lawyers. Today, we rolled out some changes that will make accessing your matters much simpler. On the right, under “active matters”, matters are now displayed in a more readable list format. Clicking on the zoom icon on each row will display the content of that matter. Up to 20 matters are displayed per page. On the left sidebar, there are now quick links to retrieve both active and closed matters with a count of each type displayed in parentheses. These counts are self-updating i.e. a page refresh is not required to update the count values. We have also introduced a “navigation” panel to the left sidebar, mirroring the navigation also available on the main navigation bar. Beneath the navigation panel is a new “actions” panel. Currently, you can create a new matter (i.e. instruct LAWYAL from here) and we anticipate more features being accessible here in the future. Search for other matters. Search results are displayed above the selected matter. 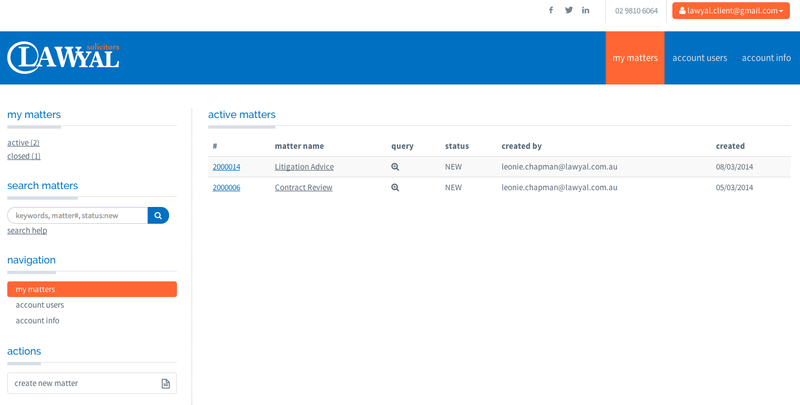 We think that this is a much cleaner layout than before and expect that navigating around your matters will be far more intuitive. As always, we welcome feedback from our users. We have many more features in the pipeline and will keep you updated on our progress.